The 2018 Ford Expedition Max offers an extended wheelbase and is equipped with a 375 hp, 470 lb-ft 3.5-liter turbocharged V6 driving either two or four wheels through a new 10-speed automatic transmission. Performance is competitive and the Platinum trim gets an additional 25 hp and 10 lb-ft. Specification levels are good with a power driver’s seat, dual-zone climate control and a reverse sensing system standard on the base XLT trim. While the top Platinum trim models get lane-keep assist, adaptive cruise control and multi-contour seats with active motion feature. Full-sized SUVs are ideal for shoppers looking for the ultimate levels of interior space and serious towing ability. The Ford Expedition is one of the biggest on the market and offers seating for up to eight in comfort, if you intend to pack it full of luggage too then the extended wheelbase Max edition raises the game even further. 2018 sees some updates to the interior of the Expedition as well as the introduction of a new transmission. Stepping into the Expedition Max the first thing you notice is the space. There is such an abundance of the stuff that generously proportioned mid-sized SUVs start to seem cramped and compromised. Base trim models offer a full 8-seat setup and all three rows can accommodate adults for longer trips. 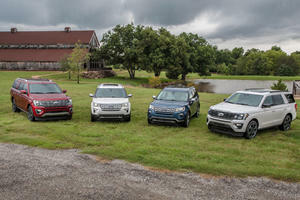 Benefiting from a recent update, the level of fit and finish is very good too although there are a few obviously below-par materials around the cabin that are out of place in such an expensive vehicle, especially when you opt for the top trim level. Aside from a few errant bits of trim, the available captain’s chairs for second row passengers are supremely comfortable and there is an absolutely cavernous trunk that is even larger in this extended wheelbase model. Flat-folding third row seats make for the largest cargo area around and the Max is a foot linger than the standard model. The independent suspension setup and accurate steering feel make the Expedition Max easier to handle than you might expect of such a massive vehicle. It is still happiest being driven at a gentle pace as the high curb weight works against any sharp direction changes or sudden braking maneuvers. Rivals are no better in this regard and care needs to be taken to navigate tighter roads and parking lots will require some forward planning to navigate successfully. The ride quality is superb and when it comes to highway driving the quiet cabin and torquey engine make it ideal for longer trips. The 3.5-liter turbocharged V6 may be down on capacity compared to most of the V8 rivals but outputs of 375 horsepower and 470 lb-ft of torque provide it with comparable performance figures. The top Platinum trim boosts power to 400 hp and 480 lb-ft and a new 10-speed automatic transmission is standard fitment on all models. Rear-wheel drive is standard although all-wheel drive is optional and the base XLT trim can further be specified with off-road shock absorbers. Fuel consumption is rated at 17/23 mpg in combined city/highway driving which compares well to the predominantly V8 powered competition. 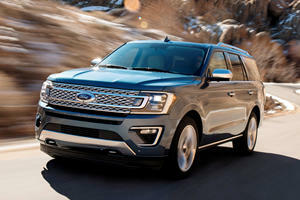 The Ford Expedition comes three trim levels, the basic XLT Max offers seating for 8, 6-way power driver seat with power-adjustable pedals, foldable second and third row seats, 4.2-inch cluster display, 9-speaker audio system with Bluetooth, USB and rear audio buttons and both front and rear climate control. 18-inch alloy wheels, cruise control, auto-dimming rearview mirror and cloth upholstery are also included. Two available packages offer among other items leather upholstery with heated and ventilated power front seats, power liftgate, 8-inch infotainment system and blind spot monitoring system. Navigation, sunroof and additional driver assistance devices are available as individual options too. Limited Max trim adds some of the XLT’s optional package contents as well as larger 20-inch wheels, leather interior, 10-way power driver and passenger seats, 12-speaker uprated audio system, front parking sensors and heated second-row seats. A Panoramic sunroof, navigation, adaptive suspension and LED headlights. The top Platinum Max trim includes elements of the Limited’s optional packages as well as a driver assistance package and adds 22-inch wheels, adaptive dampers, 360-degree camera, her interior finishes and a power increase to 400 hp and 480 lb-ft. Notable extras are second-row captain’s chairs (reducing seating capacity to 7) a self-parking system and a heavy-duty trailer towing package. 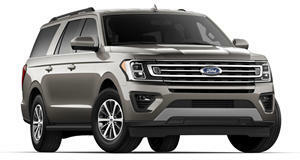 Featuring a largely aluminum construction, independent rear suspension and a downsized turbocharged engine, the Expedition Max introduces some modernity to the full-sized luxury SUV sector. It may still drive more like a truck than a crossover but the dynamics are commendable considering the sheer size and weight of this extended wheelbase model. A long list of standard and available luxury and convenience items make this SUV a solid offering that is worth considering for those needing serious cabin and cargo space. SUV cargo loading the American way. Take your pick of four new special edition models.